Bus rapid transit coming to 5600 West but when? Transit • UTA is planning for the future of a major north-south route slated for 5600 West. 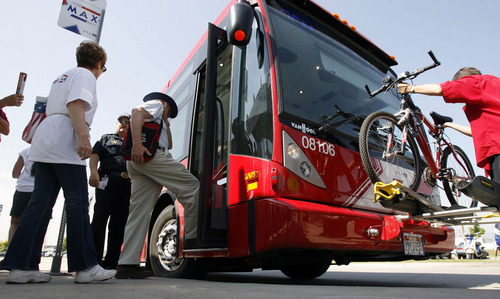 FILE PHOTO | The Salt Lake Tribune West Valley City has the state's first bus rapid transit line, called MAX, running east-west on 3500 South. Now the Utah Transit Authority is planning the second line north and south on 5600 West. 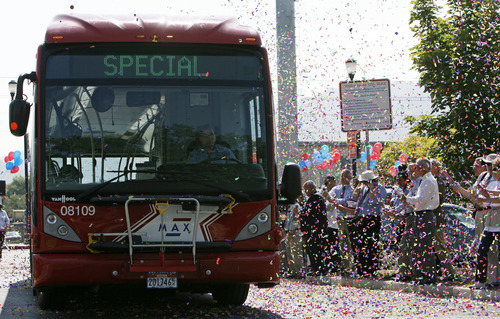 FILE PHOTO | The Salt Lake Tribune Utah Transit Authority's first bus rapid transit line, called MAX, kicked off in July. It runs east and west on 3500 South. The second such line, which has dedicated lanes for buses, is planned for a north-south line on 5600 West. Not only does West Valley City have Utah's first "bus rapid transit" system  with MAX buses that have their own lanes on 3500 South  that city (and Kearns) soon may have the second system, too, on 5600 West. But exactly when it is coming is a big question, because the Utah Transit Authority hasn't yet identified funding. UTA has moved the 5600 West project from the study phase into planning, said UTA spokesman Gerry Carpenter. A bus rapid transit project (BRT) is akin to TRAX except that it uses buses and dedicated road lanes instead of trains and tracks. "The design has progressed to about the 30 percent level, which allows us to better estimate project costs and prepare future funding scenarios," he said. "The ideal would be to have phase I of the 5600 West BRT in operation by 2015," but he adds, "We do not have a clear funding path at this point in the process." The first phase calls for adding express bus-only lanes (and limited stops with shelters) in the middle of 5600 West between 2700 South and 6200 South. Also, that first phase calls for buying rights-of-way to allow such lanes in future phases all the way from the Salt Lake City International Airport to the Old Bingham Highway in West Jordan  where it would connect with the Mid-Jordan TRAX line. Future phases under consideration also include eventually converting the 5600 West BRT into a TRAX line itself. That had upset West Valley City officials last year, who worried that UTA might try to tie up too much land and development along 5600 West for stations and parking lots for a light-rail system that might not come for 50 years, if at all. They wrote a letter last year protesting that. West Valley City Manager Wayne Pyle says the city supports a BRT line and feels it would not greatly interfere with current intersections and traffic flow. He worries that if designs are made to accommodate a future TRAX line, that could create problems with traffic now  in part because it would require larger and longer stations. "We're saying go ahead and buy land for what you may need in the future for TRAX. But for now, just design and build what you need for a BRT," Pyle said. Carpenter said the project will hinge on cooperation between the agency and the city. "UTA will not proceed with implementation of the project until we are in full agreement with the city on how it can best meet the current and future needs of their community," he said. The biggest challenge now for the 5600 BRT line is money, Carpenter added. He pointed to the recession and the way reduced sales taxes are cutting into UTA's budgets. "Some projects that were originally planned for the near future may have to be delayed unless new funding sources are identified," Carpenter said. Federal grants are likely sources. "A number of new grant programs have been introduced with a focus on transit, land use and livability that favor small projects such as this one," Carpenter said. He adds that the new streetcar project in Sugar House won such a grant, allowing it to proceed. The 5600 West project has another complication. While it has received environmental clearance from the Federal Highway Works Administration, it still awaits an environmental OK from the Federal Transit Administration. "If the project were to be funded locally or through FHWA funding sources, it could proceed immediately. However, should UTA decide to pursue grant programs administered through the FTA … it would require that UTA complete an additional environmental study to satisfy FTA requirements, which would further delay the process," Carpenter said. UTA is not just looking at 5600 West for new bus rapid transit lines, but that project is further along in the process than most. A Provo-Orem BRT to connect Brigham Young University, Utah Valley University and south Provo is at a similar stage of development. Environmental studies are looking at potential BRT paths to connect Taylorsville and Murray along 5400 South and a southwest Salt Lake County route along 12600 South. Carpenter said long-range plans also are considering BRT routes along Redwood Road, State Street, Highland Drive and 3900 South. "The next step would be to perform feasibility studies for each of those corridors," he said. The model for the 5600 West BRT has been a little different than all the others  which are along corridors that already have very high transit use. The 5600 West project is being planned mostly for future demand. Planners figure that when the Mountain View Highway opens (roughly about 5800 West), the general corridor is expected to become a major travel route for locals and through traffic. "If even a small portion of that traffic can be shifted to mass transit, it will aid in reducing congestion and environmental impacts," Carpenter said. He adds, "This transit line is also important because of how it will connect to the greater regional system. It will eventually connect to both the Mid-Jordan and Airport TRAX lines as well as to the 3500 South BRT, which will enable a greater percentage of the west-side population to get around without having to own an automobile."